We’re still toiling away on our second book trailer (watch our first one here, if you haven’t already). The new film will resemble the previous one in that both set modern compositions to old, grainy, black-and-white footage. C.E. Alexander’s current publications Book of Constants and My Wounded Specular feature in the promotional film, as do two forthcoming titles. Nearly all of the stock from our last trailer was documentary reel, with the exception of a brief scene from the scripted 1934 feature Tarzan and His Mate (starting at 2:19). 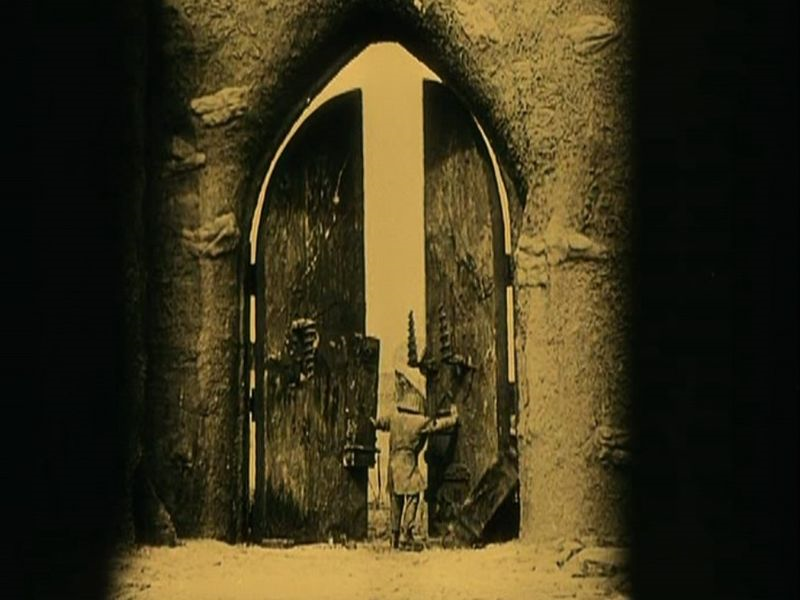 Similarly the majority of our new footage is of the unstaged variety, although one source was too beautiful to pass up: Paul Wegener’s 1920 silent horror film The Golem: How He Came into the World. Set in Renaissance-era Prague and filmed in Berlin, the movie is an adaptation of Gustav Meyrink’s 1915 anthology Der Golem. Perhaps the story line is nothing new, particularly by modern standards: a cruel decree handed down from royalty; a reckless calling forth of demons; a clumsy, handmade creature unleashed on those whom it was built to protect. But the sets were beautiful, tirelessly detailed; the lighting was potent; the cinematography truly indulgent (in time photographer Karl Freund would move to the U.S. and add his touch to an impressive list of Hollywood features). It’s difficult to cite only a few examples of the film’s visual achievements: Rabbi Loew’s home and the Jewish ghetto around it are Hieronymus Bosch canvases made real. The lumbering golem practically stinks of clay through the fourth wall. And the innovative use of shadows, the unconventional camera angles obscure portions of the screen in wonderful geometries. This is a remarkable find. Stream The Golem in its entirely below. But other than pretty footage, what does the Jewish protector myth have to do with our trailer? Not telling. Yet with Book of Constants and My Wounded Specular already live, The Shallow Cittern set for a September publication and 1991 slated for October, all will be revealed soon.